Strong branding is at the heart of strong businesses. With the Avery Conferencing Products range, it is easy to design and print professional-looking labels, cards and tags for gift branding, events and conferences from the convenience of your office computer. Choose from a selection of templates from Avery Design & Print software or customise a template to suit your brand. These are ideal to create round labels with brilliant colours and sharp text, to be used on products, packaging and marketing materials. A4 Size - White Gloss - Permanent adhesive. 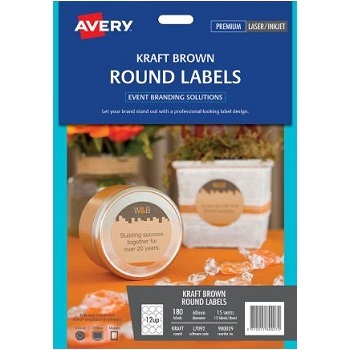 Avery® Kraft Brown Round Labels don’t just look natural, they are made from recycled material (label only). A4 Size - Recycled Brown Kraft - Permanent adhesive. 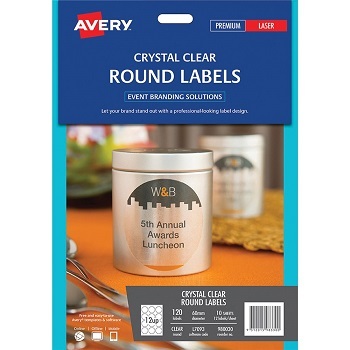 Avery® Crystal Clear Round Labels are 100% transparent and add a professional-look to your branded marketing projects. A4 Size - Crystal Clear - Permanent adhesive. These are ideal to create square labels with brilliant colours and sharp text, to be used on products, packaging and marketing materials. 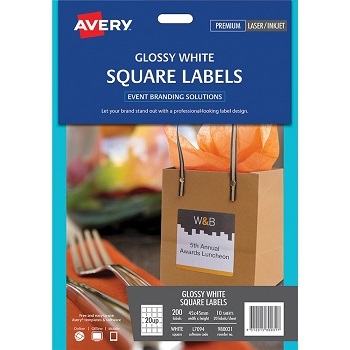 Avery® Crystal Clear Square Labels are 100% transparent and add a professional-look to your branded marketing projects. Avery® Crystal Clear Rectangular Labels let you create professionally branded marketing materials for your events and conferences. 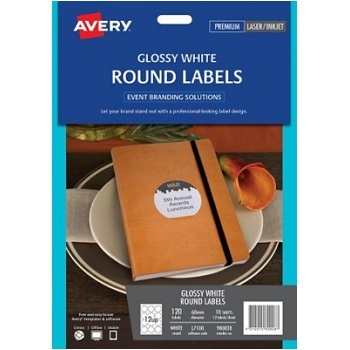 Avery® Glossy White Oval Labels make it easy to give your event or conference a premium, custom look. Avery® Kraft Brown Oval Labels don’t just look natural, they are made from recycled material (label only). Avery® Textured White Arched Labels have a unique shape and water resistant material that lets you create professional-looking labels. A4 Size - Textured White - Permanent adhesive. Avery® White Multi-Purpose Cards are great when you need to showcase your image or brand logo. The smooth, non-perforated edges and thick card stock gives you a professional, print shop-quality feel. Avery® Multi-Purpose DL Card is perfect as an invitation, agenda or thank you card. Made from flexible fabric material with removable adhesive that can be used on most textiles and removed without leaving residue. 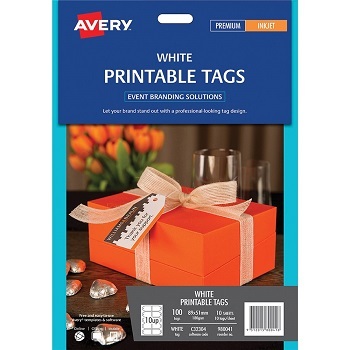 Add a touch of elegance to your next event with Avery® Printable Tags. Double-sided printing feature gives plenty of room for your logo and branding. A4 Size - Microperforated - White 180 gsm. Avery® Printable Bag Toppers come with clear, polypropylene, self-closing bags. Create and customise professional packaging with your product information or marketing messages.